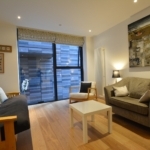 Sleeps 2 to 3 people. 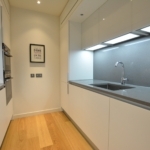 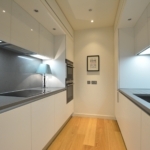 A recently completed development (2014), QMile is one of the premier addresses in Edinburgh and this one bed apartment has a private underground carspace. 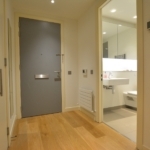 The accommodation is conveniently situated on 1st floor level (accessed by stairs or passenger lift), offering a clean and contemporary space with oak wooden floors and quality finishes throughout. 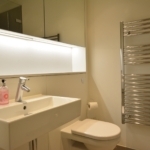 There is an open plan living area with comfortable futon sofabed, a double bedroom, designer kitchen and bathroom. 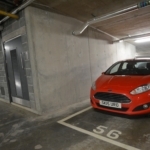 The private underground CAR PARKING space is very conveniently accessed directly from the passenger lift. 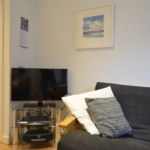 Sky TV and Wi-fi is provided and location is perfect (just off Middle Meadow Walk) and giving easy access to central Festival venues, i.e. 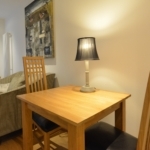 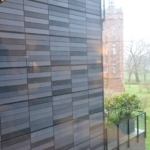 5 mins walk to both George Square and Bristo Square. 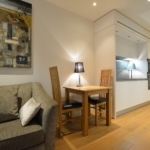 Price is £3350 for August, great value for an apartment in Edinburgh's prestigious "Quartermile" development.